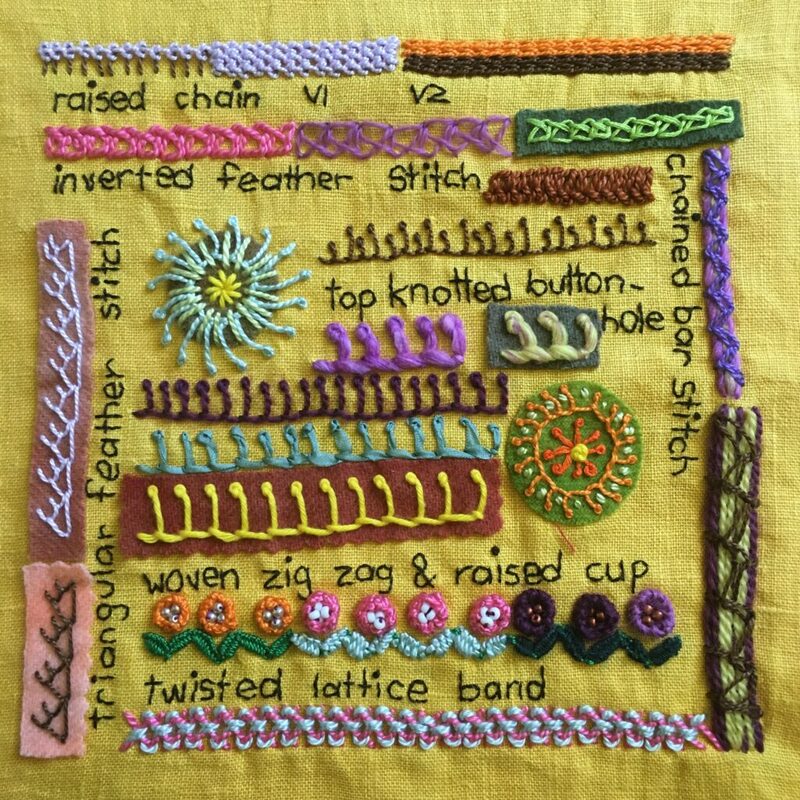 I didn’t work any more TAST samplers until early January 2017 and ended up making this one as a catch up of all the stitches I had missed. For this sampler, I basically wanted to catch up and learn all of the stitches. Raised chain versions 1 and 2: I used perle cottons to learn these stitches. They’re an immediate favourite. I can see using these stitches on bold borders on lots of projects. Inverted feather stitch: From left to right, perle cotton, crewel wool, stranded cotton. Second row, brown perle cotton worked very close together. I don’t really see myself using this stitch again, although I may be wrong. Chained bar stitch: worked in two different combinations of wool and perle cotton. I think this stitch works best when it’s worked quite small. Large chain stitches tend to shift about a lot. Top knotted buttonhole: You can probably tell this was one of my favourites! I worked it in a range of perle (mercerised) cottons, silk ribbon, soft cotton, linen and stranded embroidery cotton. I loved using it in the circular designs. Raised cup: I used stranded cotton perle cotton and crewel wool. I think it works best with the wool. I’m not really happy with the cotton stitches at all but I think the wool raised cups on the right are very nice. Woven chain: From left to right, I tried a very fine perle cotton, a thicker perle cotton and a fine crewel wool. They’re all very different an I like them all. I’ll definitely use this stitch again. Triangular feather stitch: I worked this on my feather stitch sampler early on in TAST so I stitched it here just to record it with it’s proper name. Twisted Lattice Band: Worked in perle cotton. Another one of my favourite stitches. I may revisit it in future with some different threads and scales. Next up: I go a bit nuts with a whole lot of running stitch.